I've received the email below from Google about my WordPress site and have no idea how to follow the instructions. Any help out there? 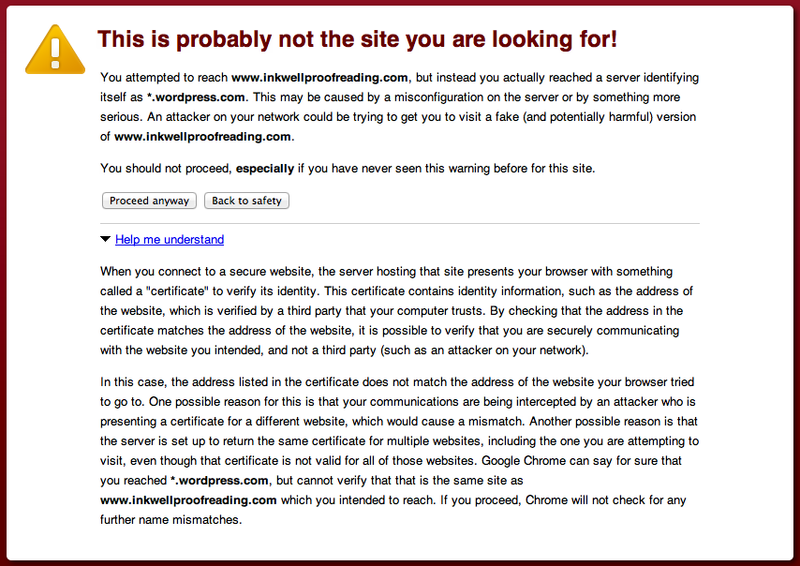 Here's the warning I get from Google Chrome when I try to access your website. The reason is because you are using a SSL certificate valid for wordpress.com subdomains for an HTTPS connection to a different domain. The certificate would work only if you use the original Actually URL (in your case https://theprovenpudding.wordpress.com). The https:// protocol requires a SSL certificate to encrypt the communication. Either use http:// or buy a certificate for your domain. Actually, I'm not sure if you can use your own certificate with the hosted version of WordPress. You should contact support to get more information.